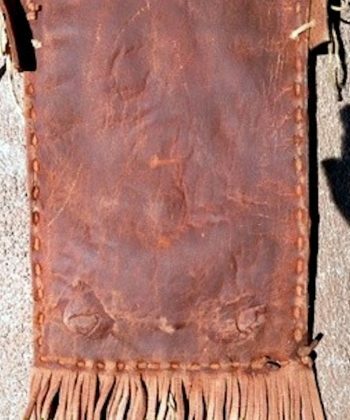 From one of our northern New Mexico pueblos, this is a hide bag, essentially a bandolier bag, fringed and decorated with a large silver concho and a domed silver button. The bag is painted/stained all over with a red mineral pigment. Made to use rather than to sell, this was long used. The same two bumpy areas on the lower edge, are visible on the back of the bag as well. There is dusty stuff inside, possibly corn meal. 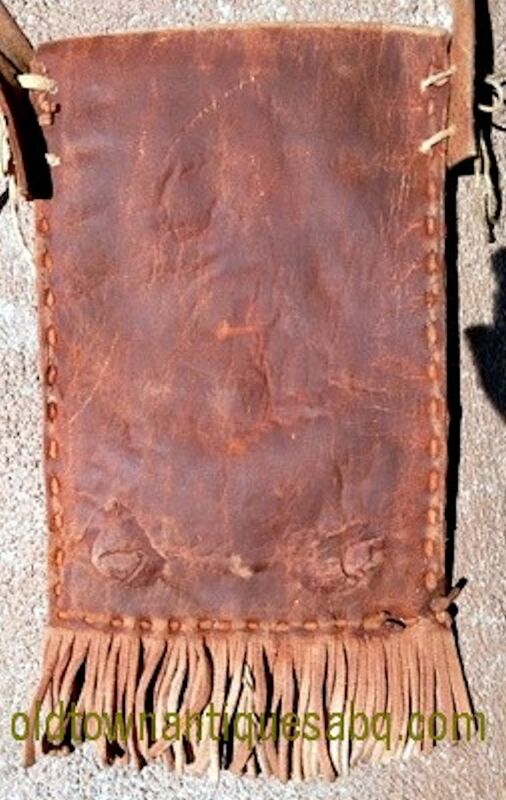 The bag measures approximately 11″ tall including the fringe x 6″ wide. The strap is about 40″ long above the bag. The front of the bag has a large stamped silver concho and the flap has a high domed silver button. The loose hide string at the bottom of the bag might have been used as a fastener at some point but the flap stays closed. A unique piece.